Many of the couples who come to see us are stuck organizing their complaints around an external symptom or problem. It’s easier for them and preserves individual self-esteem when partners deflect the focus away from themselves and place blame on the other partner for problems in their relationship. And when externalizing has become entrenched, it can be a challenge for you to shed light on each partner’s role and move them toward increased differentiation. So how do you disrupt this gridlock and help each partner create more of an internal locus of control? Early on, be careful to avoid focusing on the actual behavior. You want to communicate strongly that it will take individual growth from each of them for the relationship to develop and flourish. It's going to take openness and willingness to look deeply into what they're each doing that gets in the way of relationship growth. You might say, You two have gotten so stuck in your struggles that you have been missing each other for a long time. Change is going to come from shifting your focus. Individual Focus: you will learn to recognize how you are getting in your own way. Team Focus: you will see how you can support changes you desire by working as a team. Therapist Focus: I am not a judge or arbitrator. I am going to support you, your partner, and the team at different times. I’ll coach and help you. Some days I'm going to be confronting one of you, and some days I'm going to be confronting the other one. All of those confrontations are in service of both your individual growth and also relationship growth. If you can let me in without feeling like I am picking on you, we will move a lot faster. How does that sound to you? Structuring the process in this way gives you permission to hone in on each partner’s growing edge – how they collapse and become defensive rather than seeing and understanding one another. You begin to work towards enabling each partner to express their desires with gentleness and vulnerability, rather than criticism and blame. Moving forward, you will be reinforcing even the smallest movements that shift your clients from an external to an internal locus of control. Knowing where to focus lets you facilitate the shift away from a hostile symbiosis that’s been keeping the couple stuck, and towards differentiation with collaboration. If you’d like other ideas about how to get off to a strong start, check out Strong Start, Better Success. In the meantime, I’d like to hear from you. How do you disrupt blame? Do you think you can use some of these ideas in your work with couples? Please leave a comment below. One more thing I say early on on the reasons why it is so difficult: The illusion of multiple choices and that there is someone else out there that may be better erodes commitment because it takes energy away from the couple. I spend time in the beginning explaining why couples therapists have so much work these days: I say that establishing an equal relationship (as opposed to one in which one dominates another) is very hard because 1) most people don’t have role models for that, and because most personal experiences in relationships are hierarchical, i.e parent-child, teacher-student, boss-employee establishing patterns of either silent acquiescing or rebelling. (this idea comes from Ellyn Bader) 2) middle class economic stress or ambition creates a sort of time famine. Where there is a famine of any kind, people resort to blaming. 3) US is unique in that the middle class doesn’t have access to cheap labor like in Latin America, Aisa or Africa where they can hire help more cheaply AND there is lack of policy support for families, unlike Europeans who have child care subsidies for preschool and long paid family parental leave. So when couples have children, they think they have/can do it all themselves, and in fact, it’s an impossible job, leads to blaming. There are just not enough hands do it all, coupled with a uniquely American “do-it-yourself” culture. 4) Isolation of the couples: loss of extended family networks and full time jobs make people put all their “eggs in one basket” so to speak, and rely exclusively on each other, exceeding expectations about what’s possible. Disappointment (and then blame) occur when mates “fail” to fulfill the honeymoon illusion of perfection which includes the illusory expectation that our partners can be: Our best friends, our best lovers, our best providers, our best support system (This is Ester Perel’s idea, I think). I do a mini lecture about this and the brain, and people feel both normalized and less shame. Sorry for the long rant. Thanks for reading. Nice framing, and great way to establish a context for confrontation. Thank you for the good reminder about how as couples therapist, we will be intentionally supporting their individual growth in the presence of each other. I usually put my energy in getting partners to soften and acknowledge what core need is embedded in their blaming/externalizing. I disrupt blame by suggesting that I know each person wants more than anything to maintain connection. When a difficult issue comes up, people usually have a lot of trouble talking w|out blame, as mentioned. Each is threatened, and gets angry-scared, and then further disconnects in ways, usually, that reflect old learned patterns. 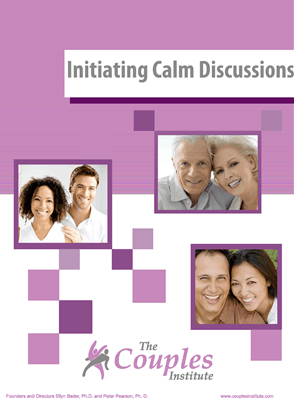 Discussing problem, disfuntional discussion, fear, disconnect, more fear pattern seems to disarm the conflict. Within tender-hearted carefully understanding communication, problems are solved if the above understanding precedes it. I am seeing a man who struggles with self regulation. He married a women with three kids and they are spoiled. He has raised his voice too often and wife is tired of it. She has agreed to try marriage counseling. I agree with your focus and will try to convey this approach as they find a couple’s therapist.